However, I got the idea to make coms with raspberry PI. Problem is I am not experienced with PI, but however, i know blibs and blobs about Linux and basic electronics. We would use existing com box and some features. Maybe by any chance, anyone would help me to start with this and give me some advice? Check with the Company Director responsible for Health and Safety and maybe your company lawyer before going much further. I am not a diver or a lawyer, but if I were putting my life in your hands on a dive I would expect you to have robust and reliable systems in place to protect me. Perhaps there are formal regulations that enforce this? Something put together by some described as "not experienced with PI, but however, i know blibs and blobs about Linux and basic electronics." does not seem to match up to that requirement. I would endorse the (perhaps discouraging) advice given by others. If equipment used in diving fails, people can quite conceivably die! Quite apart from the liability issue, would you want that on your conscience? I wonder why the existing communications boxes keep breaking. 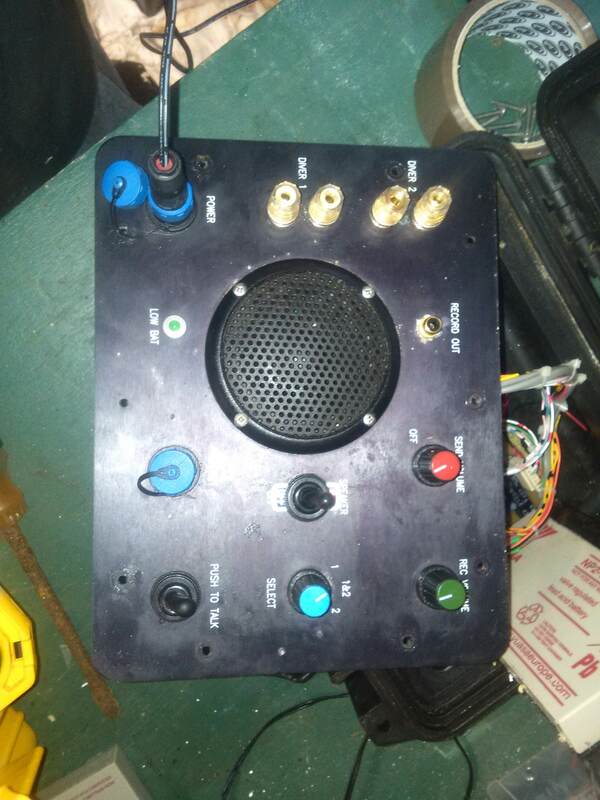 It appears to be a two channel analogue mixer in a weatherized box with talk back feature. Since the analogue circuitry needed to implement such a device is well understood, perhaps the box isn't as weatherized as it appears. The next time you put one back together, it might be prudent to squirt a little silicone caulk around the seams before tightening down the screws. Do you use batteries with the device? That could be another point of failure. As you seem to be looking for a Pi project, one could ask what good could a Pi be for a surface supply diving enterprise? As you may already know, the Pi is a real computer designed for teaching children how to program that has been appropriated by hobbyists to build IoT devices for home use. The resulting reliability of each project varies with the skill of the maker. However, most of the benefits come not from reliability but from flexibility and originality. Unfortunately, the Pi doesn't have built-in analogue inputs. While the forums are full of people asking for more RAM and faster USB ports in order to duplicate the functionality of a desktop computer, what makes the Pi interesting is that it is not a desktop computer but more of an up in a balloon, around in a robot type of device. In my opinion, an important feature the Pi missing in this regard is built-in analogue to digital converters that could be used as audio inputs, joystick interfaces and for various sensing and control applications. Just like GPIO, having analogue inputs would open doors to many people who don't have the resources to design or purchase add-on hardware for each project and experiment. Making such hardware built-in would also lead to standardisation and focus for the community. Back on topic, the Pi does have built-in audio outputs, so it would be easy to turn a broken communications box into an internet radio that could be placed in the office or home as a conversation piece. It also has a built-in camera interface with matching camera which could be used to monitor operations at the surface for training and analysis. With a USB microphone and audio input dongle, communications from the audio output of a working analogue communications box could be recorded as well. Making either of these last two ideas reliable will likely be surprisingly difficult. While audio hardware along with digital mixing software could, in theory, be used to replace the entire communications box, the result would likely have the audio quality of a satellite telephone connection from India to Mexico, whereas, the analogue solution you are currently using introduces almost no latency or lag and should be more reliable. I have built marine based systems for several years, and a unshielded Pi unfortunately drops an RF spur in the emergency locator safety bands. USB sound-cards are common (some have stereo mic inputs), and broadcasting AX.25 over audio channels has been around since the dawn of the internet. Look at the direwolf deb package for details. commercial kits are around that will probably end up costing less than developing something that needs to be reliable. Last edited by Joel_Mckay on Thu Sep 20, 2018 12:59 pm, edited 1 time in total. Whilst we do not claim to pass anything but the consumer electronics EMI standards, just out of interest, where was the spike? Also which model Pi did you see it on and did you have anything plugged in to it? Note to the OP, we do not recommend the Pi be used in any safety critical environment. Safety critical devices are expensive for a reason, much testing and redundancy! jamesh wrote: Whilst we do not claim to pass anything but the consumer electronics EMI standards, just out of interest, where was the spike? Also which model Pi did you see it on and did you have anything plugged in to it? We did ultimately solve our specific issues, but it would have been the same project no matter which SOM supplier we chose. I still build quite a few hobby projects with these, and like the designs consistency even if it has some challenges. Blimey, those spikes are tiny! I guess the rules are somewhat stricter than for consumer ratings! Thanks for the graph, quite interesting! Everything looks small standing far away, and depends on the orientation of the object relative to the receivers antenna. Even if we ignore the radar exposure tests, most FCC/CE approved consumer land equipment will fail marine IEC rules.